One of the only British winners at this year's Oscars described her award for a documentary about rescue volunteers in Syria as "bittersweet". 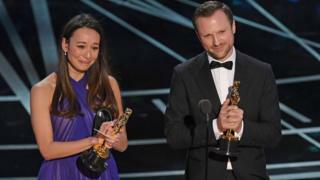 Producer Joanna Natasegara and director Orlando von Einsiedel were behind the film White Helmets, which won the best documentary short. Former Cardiff University student Ms Natasegara said she "wished we never had to make the film". "So we're pleased at least they get the recognition they deserve," she said. The film, commissioned by Netflix, highlights the work of the Syrian Civil Defence - otherwise known as the White Helmets - a group of about 3,000 volunteers who try to rescue those trapped and injured in the country's bitter conflict. However, White Helmets' cinematographer Khaled Khateeb was unable to attend the Oscars ceremony after being barred from boarding a flight from Turkey, after US officials reported finding "derogatory information'' about him. Accepting the award on stage, Manchester-born Ms Natasegara broke into tears as she said: "Most of all - thank you to the White Helmets." She was greeted with a standing ovation by the audience as a message from the absent Syrian film maker was read out by director von Einsiedal urging them to "work on the side of life to stop the bloodshed in Syria and around the world". Speaking to the BBC about the White Helmets after the awards, Ms Natasegara said: "We are so thrilled for them. We feel like the world is recognising their work. "The whole situation is bittersweet. We should never have had to make this film. We wished we didn't have to be here tonight with this award - but we do." Back home in Wales, her mother said she was "almost speechless" about the win. "But it's well deserved - it's a really good film and they have done really, really well," said Barbara Natasegara, who runs a charity based in Cardiff tackling issues surrounding domestic and sexual violence and hate crimes. "I've spoken to her very, very briefly. She was just very excited. She said she didn't expect to get it. "She is still in shock I think." She said her daughter had a "passion for social justice and human rights", and had volunteered and worked for Safer Wales projects after graduating from Cardiff University. "She had a fairly early exposure to what can go wrong in life, and a keenness always to speak up for truth for those who perhaps have not got a voice to speak for themselves," the producer's mother told BBC Radio Wales' Good Morning Wales. The award is the second time the film maker has found herself at the Oscars, after a nomination in 2015 for another documentary about the fight to save mountain gorillas in Africa, called Virunga, which was also directed by von Einsiedal.